If you are seeking holistic pain relief in Thousand Oaks, Duben Holistic Chiropractic Center is here to help! Drs. Duben and Erickson and the entire staff are fully trained in holistic pain relief in a practice that does not use drugs of any type in their treatment. We offer NET Therapy, Laser Therapy, and Applied Kinesiology to our patients in the holistic treatment of their pain. If you are suffering from chronic pain or a lingering injury, holistic pain relief can help. All of the methods employed at our Chiropractic Center are completely holistic in nature and we do not use drugs of any kind in our treatments. There are numerous ways to relieve pain through holistic therapies, and three of the methods that offer positive results are NET Therapy, Laser Therapy, and Applied Kinesiology. All of these treatments allow the body to find the proper alignment that is necessary for total wellness and combine attention to all aspects of wellness including the mind, body, and spirit. Physical pain can also be the manifestation of emotional and other factors that are creating a negative physical response in the body. NET Therapy - the Neuro-Emotional Technique allows your chiropractor or other medical professionals to help you release stuck emotions that are having a negative effect on the body. This hands-on technique combines physical as well as emotional strategies for fostering total wellness. NET Therapy releases emotional impressions that have created a physical manifestation of the body. Laser Therapy - this conservative technique utilizes laser light therapy to treat acute injuries, chronic pain, and nerve damage. This therapy allows the body to improve its own efforts to heal itself and strengthen problem areas. Laser Therapy is an effective treatment that replaces other treatment methods that rely heavily on drugs and medications. Applied Kinesiology - commonly known as AK, this practice combines technology with muscle testing to determine which areas of the body are not functioning in an optimal manner. Armed with this information the Kinesiologist is able to treat the cause of many ailments rather than just the symptoms. All of these treatment options are entirely holistic and drug-free. 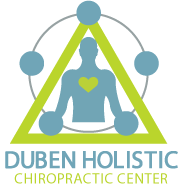 The Duben Holistic Chiropractic Center offers treatments that are drug-free and safe and healthy for every body. We look forward to working with you to provide pain relief in a holistic manner. Give us a call today at 805-468-4437 to schedule your comprehensive and drug-free appointment.